New South Wales is a nature lover’s playground, offering up a wide variety of wild sights at every twist and turn. From stunning beaches at the eastern edge of the state to mountainous wilderness further inland, there’s something for everyone to enjoy. Australia’s highest peak, Mount Kosciuszko towers overhead at an impressive 2.2km high. A leisurely two hour’s drive from Sydney, Kosciuszko National Park offers a range of activities for all weather. In summer, venture here for hiking, kayaking and horse-riding. The warmer months are the perfect time to be in the mountains – the weather remains consistently pleasant, and you’ll be treated to some of Australia’s most magnificent flora and fauna. When the weather gets cooler, the mountain becomes a destination for snow seekers. Take to the slopes on a pair of skis, try your luck at snowboarding, or ride the 15-minute long chairlift that carries you through all manner of mountain scenery. 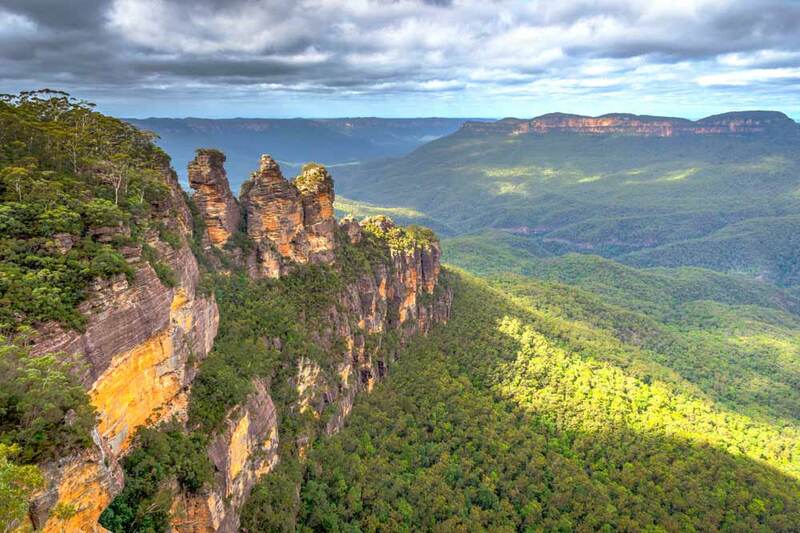 Relax and rejuvenate, or work up a sweat – the choice is yours in the Blue Mountains. The rugged landscape is the perfect place to organise a retreat, with families and couples travelling to the area to experience the serenity of the wilderness. Pull out your hiking boots and weave your way through the multitude of bushwalking tracks, or jump on a horse to ride the day away. For a truly spectacular view, venture out to the Three Sisters, an impressive rock formation that, Aboriginal legend has it, was created when three women were turned to stone. Standing at nearly one kilometre high, the structure located at Echo Point is one you simply can’t miss. If the seaside is more your thing, venture out to Murramarang National Park where you’ll come across some of the most spectacular camping spots in New South Wales. Located just over 2 hours’ drive from Byron Bay, Pebbly Beach is a secluded swimming spot that offers something unique: as the name suggests, the ground is covered by a multitude of pebbles instead of sand.